Ski jumping in my hometown, Lake Placid, NY, is fun. Competing at home is even more fun. Placing second at the US National Championships in Lake Placid is the most fun. In April, I made a huge life change and moved to Slovenia to dedicate my time, energy and resources to ski jumping. I joined a local ski club and spent the entire summer relearning the sport. I had Sundays off but Monday through Saturday was all business and alongside the jump training, I had two gym sessions every day. Following my own path meant uncertainty as I no longer had a national team nomination. Heading into the Flaming Leaves Festival weekend in Lake Placid, I had a lot on the line. I needed an excellent performance in order to secure my spot in the first World Cups of the winter season. If I failed to jump well, I risked missing an entire season of competitions, and starting at the bottom and climbing my way back up to the National Team by way of domestic competitions and then lower level international competitions. Jumping in my hometown also meant facing off against my longtime teammate, rival and friend, Tara Geraghty- Moats. She is from Vermont and I am from New York, and we grew up jumping together. From an early age, we were both quite competitive and whenever we met on the hill, it was war. To say we were cordial to each other is an understatement. I mean, we were 8 and 9 years old, with ratty hair and a strong will to come in first. Fast forward 14 years, and we were the same girls, at the same venue, jumping against each other. Things have changed between us though. Instead of our backgrounds and shared history pitting us against each other, it is now a unifying force. On the National Team, we have to hold our ground as the East Coast girls against our Western, Park City counterparts. My first jump on festival day was not my best but I knew what I needed to do for success in the second round. Heading into round two, I sat at the top of the K90 at the Mackenzie Intervale Ski Jumps and surprisingly felt calm. Tara was leading after the first jump and we were the last two in the final round of the National Championships. I went first and as I was about to climb onto the start gate to prepare, we silently turned to each other and high fived, solemnly nodding our heads. Tara knew what this competition meant to me, and she also believed I could perform at that exact moment. Coming off the take off and into the flight phase, I knew I had a solid jump but knew I needed to push myself. I dug deep and flew down to 100 meters, forcing myself to land telemark style. It wasn't until I slowed down in the outrun with a huge smile on my face that I heard the crowd around me, and knew that I had more community support than I had ever imagined. Tara ended up sending it even further, to a staggering 102 meters and all I could do was laugh and give her a huge hug. Some things never change. I know that we are going to be pushing and pulling each other in this sport for many years to come and I wouldn't have it any other way. Born and raised in the Adirondack Mountains in Lake Placid, NY, Nina does not know a life without skiing. Walking and learning to ski came as a package deal and since then, there has been no turning back. At the age of 8, she took her first real ski jump and fell in love with the sport. She reasons, "I mean, who doesn't want the ability to fly?!" 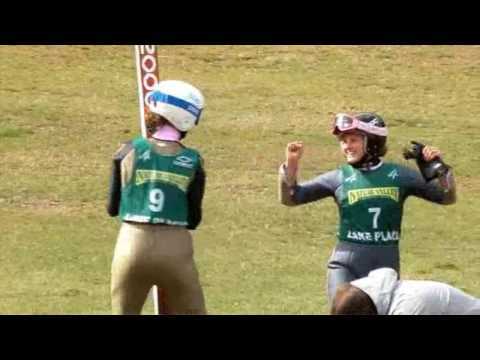 Her roots will always be in Lake Placid, but she has spent the last few years traveling the world in the pursuit of ski jumping and now resides in Ljubljana, Slovenia. Her favorite destination, so far, is actually a tie – Lillehammer, Norway (because of the waffles) and Sapporo, Japan. In between training and competing, Nina loves taking pictures, kite boarding, and going on adventures.